As Vince, our New York Gallery Director, and I looked at our new gallery, which is almost ready for prime time viewing, one work of art in particular caught our eye. It was not the 18th century decorative arts or the Old Master paintings and drawings for which we have been known for over a century, but it was an Art Nouveau Grandfather Clock. Penelope and I acquired it 25 years ago and it spent over a decade gracing the living room of our Park Avenue apartment and later over a decade in our bedroom in our townhouse. The story began on a visit to the Macklowe Gallery’s restoration studio where we were reviewing the work being done to a piece that we had purchased from the Lloyd Macklowe. 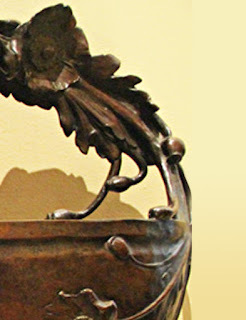 As my eyes wandered around I spotted a bit of a bronze jardinière (planter) sticking out from under a work bench. It absolutely epitomized the Art Nouveau spirit and I loved it so much that, without even looking at my wife, I said to Lloyd, “I’ll take it”. Instead of saying, “sold” he said, “it’s a bit larger than you think”. Judging from the detail that I had seen I figured it was an object you set on a table. It looked like the work of one of the greatest artists of the period, François-Rupert Carabin (1862-1932). Well it wasn’t either. 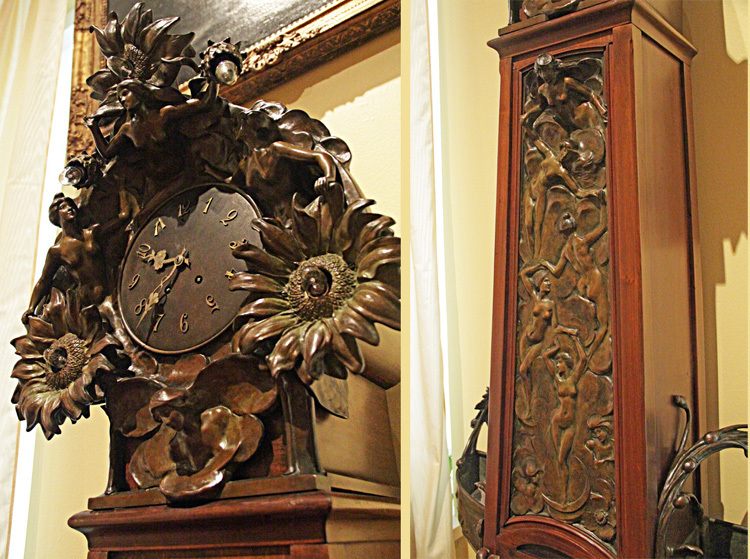 It was an eight foot plus grandfather’s clock with two such jardinières! Only problem was that we lived in a 5th floor walk-up at the time with 8 ½ foot ceilings! I just couldn’t leave it behind, however, and asked my father if we could just leave it at our 57th Street gallery for a time. He agreed and that is where it rested until a couple of years after when we bought our apartment on Park Avenue. Meanwhile, we had some time to do research on the piece and learned that it was not by Carabin though the greatest expert for this artist at the time exclaimed Carabin as soon as he saw it. You see, unfortunately, one of the bronzes is signed ‘Jouant’ for Jules Jouant (active 1885-1913) about whom we know precious little. Maurice Rheims (1910-2003) a major figure, as a collector and expert of the period suggested that the case be attributed to the architect Hector Guimard (1867-1942). What we did learn later is that this clock is one of two known and that one of them was in the 1904 World’s Fair in St. Louis. Look at some of the details, there are twelve female nudes representing the hours of the day; the ones at the top are surrounded by sunflowers symbolizing midday. 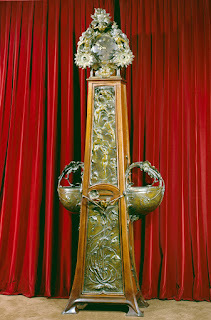 The clock is wired for electricity with a light bulb at the center of each sunflower. The figure of night stands closed eyed on a crescent moon with poppies surrounding her. 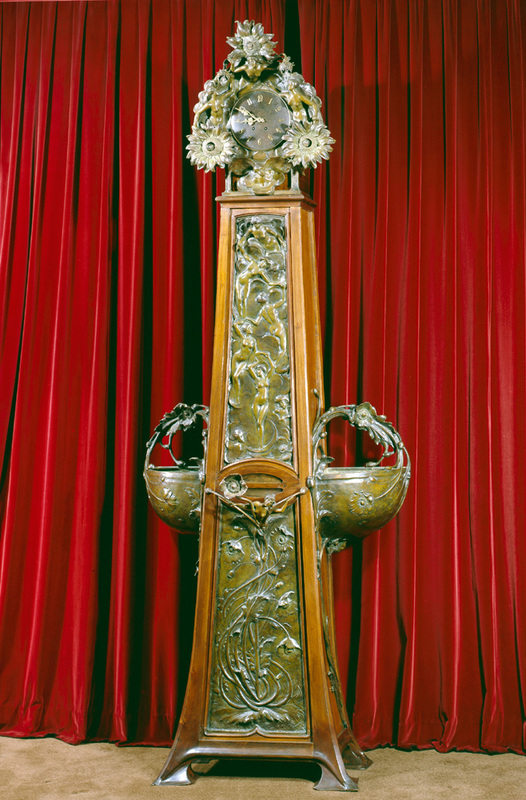 This combination of sculptural invention with electric light, that was just coming into usage at the beginning of the 20th century, would have made a state-of-the-art representation of French furniture for a World’s Fair. Our new life style in New York and Santa Fe has led us to change our collecting goals. So it is time for someone else to get the same pleasure out of this piece as Penelope and I have.